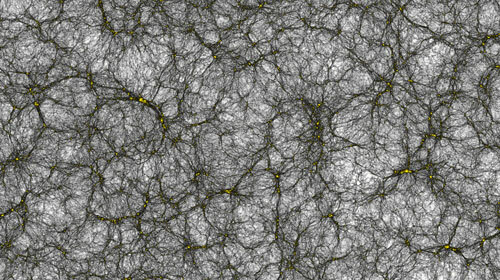 (Nanowerk News) Researchers from the University of Zurich have simulated the formation of our entire Universe with a large supercomputer. A gigantic catalogue of about 25 billion virtual galaxies has been generated from 2 trillion digital particles. This catalogue is being used to calibrate the experiments on board the Euclid satellite, that will be launched in 2020 with the objective of investigating the nature of dark matter and dark energy. Over a period of three years, a group of astrophysicists from the University of Zurich has developed and optimised a revolutionary code to describe with unprecedented accuracy the dynamics of dark matter and the formation of large-scale structures in the Universe. As Joachim Stadel, Douglas Potter and Romain Teyssier report in their recently published paper (Computational Astrophysics and Cosmology, "PKDGRAV3: Beyond Trillion Particle Cosmological Simulations for the Next Era of Galaxy Surveys"), the code (called PKDGRAV3) has been designed to use optimally the available memory and processing power of modern supercomputing architectures, such as the "Piz Daint" supercomputer of the Swiss National Computing Center (CSCS). The code was executed on this world-leading machine for only 80 hours, and generated a virtual universe of two trillion (i.e., two thousand billion or 2 x 1012) macro-particles representing the dark matter fluid, from which a catalogue of 25 billion virtual galaxies was extracted. Thanks to the high precision of their calculation, featuring a dark matter fluid evolving under its own gravity, the researchers have simulated the formation of small concentration of matter, called dark matter halos, in which we believe galaxies like the Milky Way form. The challenge of this simulation was to model galaxies as small as one tenth of the Milky Way, in a volume as large as our entire observable Universe. This was the requirement set by the European Euclid mission, whose main objective is to explore the dark side of the Universe. Indeed, about 95 percent of the Universe is dark. The cosmos consists of 23 percent of dark matter and 72 percent of dark energy. "The nature of dark energy remains one of the main unsolved puzzles in modern science," says Romain Teyssier, UZH professor for computational astrophysics. A puzzle that can be cracked only through indirect observation: When the Euclid satellite will capture the light of billions of galaxies in large areas of the sky, astronomers will measure very subtle distortions that arise from the deflection of light of these background galaxies by a foreground, invisible distribution of mass – dark matter. "That is comparable to the distortion of light by a somewhat uneven glass pane," says Joachim Stadel from the Institute for Computational Science of the UZH. This new virtual galaxy catalogue will help optimize the observational strategy of the Euclid experiment and minimize various sources of error, before the satellite embarks on its six-year data collecting mission in 2020. "Euclid will perform a tomographic map of our Universe, tracing back in time more than 10-billion-year of evolution in the cosmos," Stadel says. From the Euclid data, researchers will obtain new information on the nature of this mysterious dark energy, but also hope to discover new physics beyond the standard model, such as a modified version of general relativity or a new type of particle.